The revolution in molecular gastronomy did not begin with Ferran Adrià’s experiments at El Bullí in 1998, it began the year before, and was heralded by the marketing of one of the least successful soft drinks ever created. This is a photo I took just two days ago of the bottle handed to me thirteen years ago. It hasn’t changed at all. What keeps the blobs in position? The liquid is infused with gellan gum, which creates a support matrix for the spheres, which are at a neutral buoyancy with the clear liquid. The addition of a sugar – in this case corn syrup – improves the clarity of the liquid and changes the density to match that of the blobs. While Orbitz was still available it became a popular science lab demonstration. Adding a salt solution to the contents would cause the spheres to sink: the salt both changed the density and disrupted the gellan protein matrix. Adding a sugar solution would cause the spheres to rise, as they would be less dense than the liquid. Much to the disappointment of science teachers nationwide, Orbitz failed to last even a year in the hyper-competitive soft drink market. It was clearly (heh) ahead of its time, as evidenced by the URL printed on the bottle cap (you can see the “http” in the photo above): http://www.orbitz.com. This explains why I never think of travel when I see the word “Orbitz.” I think of food from the future. This entry was posted in food & cooking, science and tagged food, science. Bookmark the permalink. 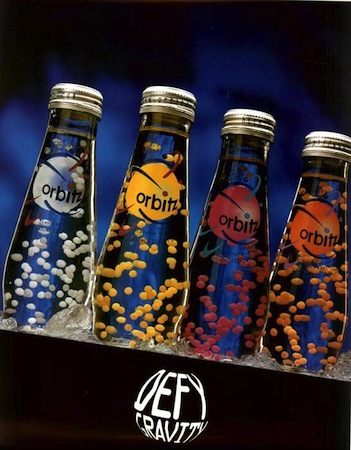 I remember being amazed that Orbitz sodas had a URL on the cap! Those were the days. Like many people, I sampled precisely one Orbitz and swore off of them forever. I do drink coconut water* with bits of coconut pulp floating in it, though, which is a very similar experience. Now that I have the necessary ingredients, it wouldn’t take me long to reverse engineer the floating spheres effect, but with liquid-filed spheres in something that tastes a bit more palatable. Yes, coconuts have two liquid products: the water that naturally occurs, and the thick white stuff usually referred to as “cream of coconut” which is made from the coconut meat. Yet another “milk/cream” loophole, another job for GRAMMARHULK. 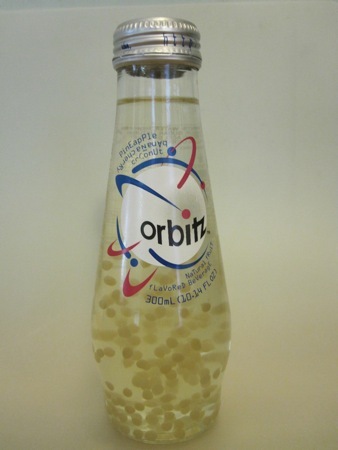 Orbitz was disgusting but it was not really molecular gastronomy, it was just an over-use of food additives! !